As I've been raiding the ebay much as of lately, I came across those mint, unissued pair of wood and canvas 'Schneeschuhe'. The seller insisted those were of Italian alpini model used during the war. I presume similar models were used across the Alps at that time. Yes, those are pretty much the standard design for European snowshoes used since about the 1800's. 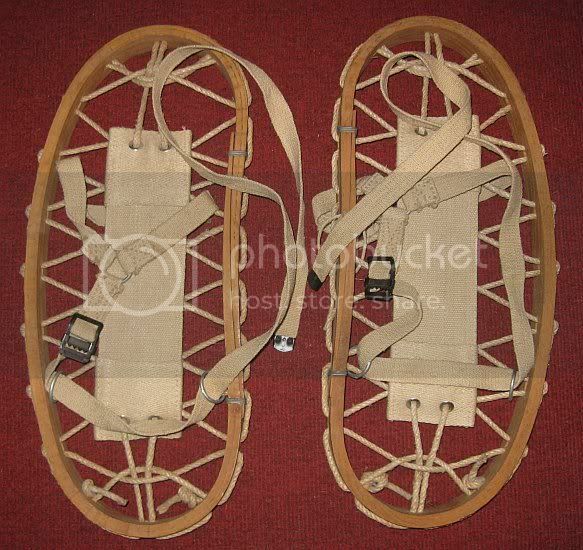 The wartime German snowshoes usually have a metal heel binding with hemp webbing and roller buckles. Sometimes you can still find this style of snowshoe currently being made. I bought a pair in a sports shop in Munich back in the 1980's.